THANKS - AND GET READY FOR UBICOMP 2003! My sincere thanks to everyone who helped make UbiComp 2002 such an amazing experience - volunteers, sponsors, exhibitors, presenters, and of course the approximately 500 delegates who made this the biggest UbiComp conference yet! Everyone seemed to have had a good time and the feedback has been overwhelmingly positive. The conference also generated a lot of media response, including radio appearances and articles in leading trade papers such as Computer Sweden. I will take a break from conference chairing now, but rest assured that the future of the UbiComp conference is in good hands. 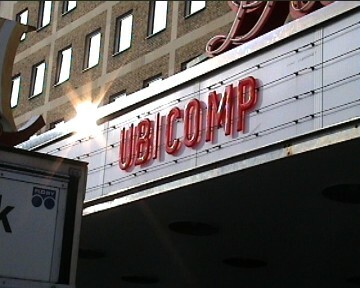 The next UbiComp conference will be held in Seattle, Washington, USA on October 12-15, 2003. Click here for the UbiComp 2003 website! Unfortunately we ran out of the Adjunct Proccedings volume. For those who didn't get one, it is available for download as a 4,6 MB PDF file. We also ran out of the UbiComp 2002 proceedings, published by Springer Verlag (LNCS 2498, ISBN 3-540-44267-7, list price €48). All registered delegates who did not get their proceedings at the conference should have received one through the mail. If you are interested in buying additional copies, they can be ordered from Springer's web site. The UbiComp 2002 proceedings are also available on-line courtesy of Springer Link. Follow the link below; note that access to the full text requires a Springer Link account! One of the most well-recieved parts of UbiComp 2002 was the video program. We have received many requests for copies of the videos that were shown, in particular the "historical" videos. Unfortunately we can not easily distribute these videos since we do not have the copyright and only had permissions to show them at the conference. Former UbiComp chair Gregory Abowd has volunteered to create a UbiComp video resource, based on the Ubicomp 2002 video program! Visit his homepage for contact information.